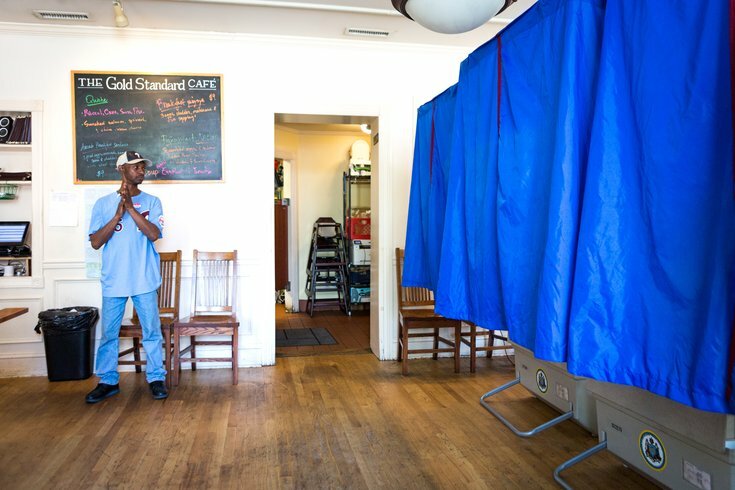 Voting machine inspector Mike Brown works at the polling location in the dining room of The Gold Standard Cafe on Baltimore Ave. in West Philadelphia, Tuesday, May 15, 2018. Philadelphia’s City Commissioners voted Wednesday in favor of a new voting machines system, which feature bar code readers and printed ballots. The machines, called the ExpressVote XL, are manufactured by Election Systems & Software. They operated by a voter first using a touchscreen to make his or her selections. The machine then prints a completed paper ballot with both a bar code and plain text showing the voter's selections. That bar code is then read by a scanner, which records the votes, according to Philly.com. The City Commissioners touted their choice in a tweet Wednesday afternoon. Pennsylvania had formed a Blue Ribbon Commission to evaluate county's election security methods statewide, and it asserted Pennsylvania’s elections are at risk because of its voting methods and machinery. And the argument over hand-marking ballots versus making ballot selections on a screen and reading a bar code came up in Georgia in recent months, after that state struggled with widespread reports of voter suppression during the 2018 midterm elections. In December, Montgomery County set aside nearly $6 million to upgrade its voting machines to voter-marked paper balloting, singing a contract with Dominion Voting Systems in Denver, Colorado. With that system, voters will use a pen to fill out paper ballots, then have opportunities to check their ballots' accuracy, before having their votes scanned. Montgomery County's system is expected to be in place before the May primary election. The push to update the Philadelphia's voting machines is up against a ticking clock. In April, Pennsylvania Secretary of State Robert Torres directed all Pennsylvania counties to have “voter-verifiable paper-record voting systems” by the end of 2020. The Philadelphia City Commissioner’s Office shortly thereafter had to bump up its previous timeline for updating Philadelphia’s voting machines in order to roll out updates before the 2019 mayoral and 2020 presidential elections.